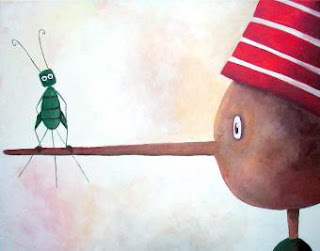 There are beautiful spiritual truths to the Pinnochio story: growing a conscience, pleasure vs. sacrifice, truth and lies, love, becoming real. Oh, and how about your body changing as if it had a mind of it's own? Have you ever felt like you were swallowed by a whale? What was that about? Has your own moral development followed the path of Pinnochio? What does being made of wood mean to you?